The distinctive combination of antique masks centring lozenges above a lappet-carved frieze with monopodia legs and a detached baluster-turned crestrail firmly link these elegant, classically-inspired chairs to the documented oeuvre of the Luxembourg-born ébéniste Bernard Molitor (maître in 1787). A virtually identical set of dining chairs was sold in these Rooms, 19 May 1988, lot 195. This latter set was sold together with a pair of day beds which are now firmly attributed to Molitor and identified as having been purchased by the Swiss collector General Nicolas-Antoine-Xavier de Castella de Berlens for his château at Wallenried, near Fribourg, Switzerland (see U.Leben, Molitor, London, 1992, pp.204-5, cat. 156B, also illustrated on front cover). The lappet-carved frieze also appears on a day bed stamped Molitor, sold Sotheby's Monaco, 17 June 1988, lot 667. 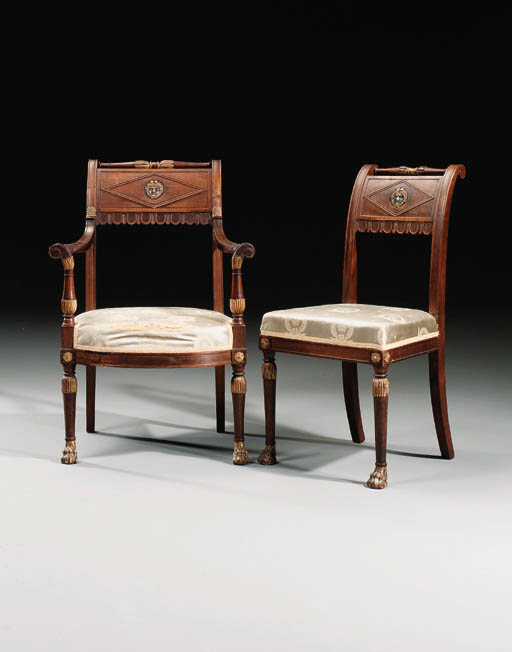 Following the abolition of the guild system in 1791 ébénistes were no longer restricted to making case furniture and Molitor was one of the first cabinet-makers to profit from this relaxation of the rules to include a wide range of seat furniture in his repertoire in fashionable à l'antique styles.